For over two decades, Abby Seixas has taught women how to slow down and reclaim their lives from the tyranny of their to-do lists. 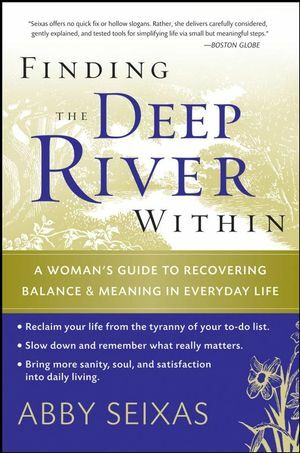 Based on the experiences of women whose lives have been transformed by her workshops, this highly anticipated first book presents her comprehensive program to nurture contact with the Deep River Within, the soul-nourishing dimension in each of us that flows beneath the busyness of daily life. With gentle encouragement, practical guidance, and compelling stories of struggle and success, Finding the Deep River Within details the three preliminary doorways and six core practices for inviting the rich resources of our deeper nature into everyday life. Abby Seixas is a psychotherapist specializing in issues of life balance. Her work has been featured in national and local media, including NBC's The Today Show, the Hallmark Channel, O. The Oprah Magazine, Self, Body + Soul, Woman's Day and The Boston Globe. She is the mother of two grown children and lives with her husband near Boston, Massachusetts. Deep River Exercises and Practices. Part One: Thirsting for the Deep River Realm. 1. The Disease of A-Thousand-Things-To-Do. 2. The Deep River Within. Part Two: Touching the Deep River: The Practices. Part Three: Keeping the Deep River Flowing. Deep River Within Abby Seixas Visit author Abby Seixas's site for more information about her ongoing work.